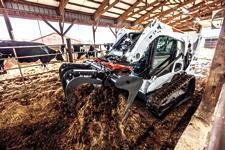 Leaving the cab to switch out hydraulic attachments can eat up the most productive times of your day. Keep your productivity high by using the the Bob-Dock™ attachment mounting system to quickly change out hydraulic attachments by pressing a switch. Once you have it, you’ll never want to get rid of it. Defend against downtime. The floating coupler block provides movement and flexibility to retain strong, easy and repeatable connections in addition to longer overall coupler life. 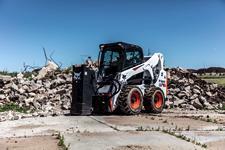 The system also reduces the risk of damage due to an operator forgetting to disconnect hydraulic hoses from an attachment before moving the machine. Switch out for the right attachment in seconds. When you’re up against a hard deadline, you know how valuable each minute is. The Bob-Dock mounting system allows you to switch from one hydraulic attachment to another in seconds, allowing you to keep making progress toward a finished project. Only leave the cab when you have to. 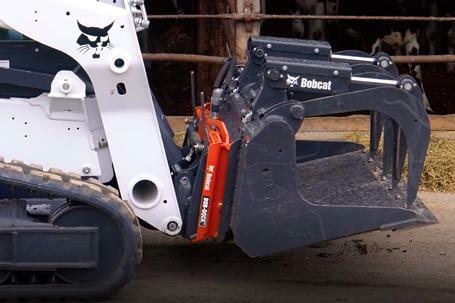 With the Bob-Dock mounting system, you can change most hydraulic attachments without stepping outside the cab to remove or connect hoses. This makes it an ideal solution for operators taking on challenging jobs in harsh climates, such as clearing snow after a storm, cleaning out barns, and summer construction projects. While the Bob-Dock mounting system’s floating coupler block equips your loader with a hands-free connection point, the standard couplers located on the lift arm remain ready to use. 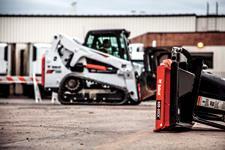 You can utilize the full lineup of approved Bobcat attachments – with or without the Bob-Dock adapter plate attached. 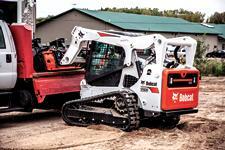 The Bob-Dock mounting system can be used with the following Bobcat loaders and attachments.